The upward trajectory of iOS device sales has Apple on pace to reach one billion sold by late 2014 or early 2015, according to a new analysis. The projection was published on Monday by Horace Dediu of Asymco, who has projected iOS device sales through iTunes account growth. Apple announced at its iPhone 5 event last week that currently it has 435 million total active iTunes accounts. Dediu calculated that Apple is currently adding about 12 million new iTunes accounts every month. He found that this growth pattern mirrors corresponding growth in iOS usage. Though he admitted the numbers are "not a very precise forecast," they do suggest that Apple will sell a total of one billion iOS devices  iPhone, iPad and iPod touch  by late 2014 or early 2015. Last week, Apple Chief Executive Tim Cook revealed that his company has sold a total of 400 million iOS devices through the month of June. Apple's march to 400 million iOS devices sold to date began in mid-2007 with the launch of the first iPhone. If the trends tracked by Dediu prove accurate, that would mean Apple will more than double the total number of iOS devices sold in the next two years. 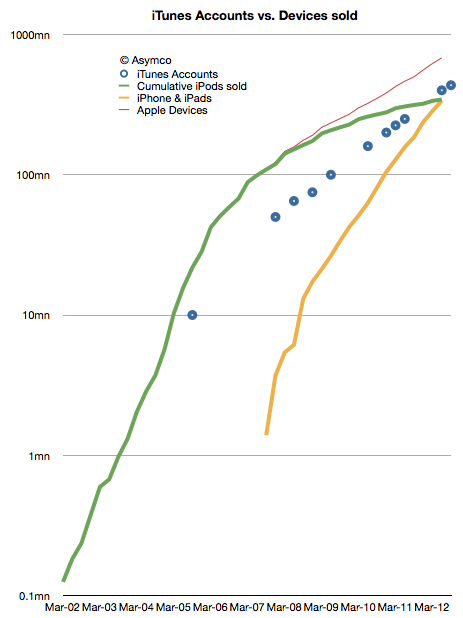 While the first 400 million sales took five years to achieve, current growth trends suggest Apple will sell another 600 million by early 2015.